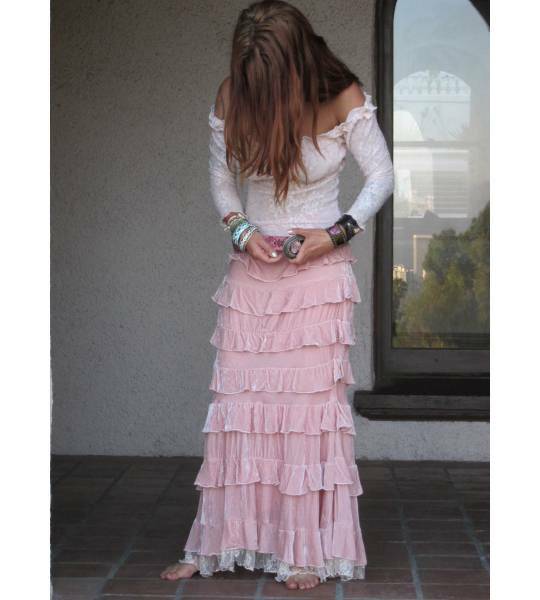 When you slip into Marrika Nakk’s superb Velvet Princess Skirt in Pink, you will instantly feel 'pretty in pink'. When you slip into Marrika Nakk’s superb Velvet Princess Skirt in Pink, you will instantly feel 'pretty in pink'. With magnificent ruffles extending to the floor, this skirt will give your hips a softer and curvier look. Try pairing it with Marrika’s Off-Shoulder Bridal Lace Top. Feeling Pretty in Pink is an understatement !! When wearing this skirt you feel Magical! I LOVE My Princess Skirt by Marrika Nakk!